We still have openings for spot acts. consider putting in an application on-line on the www.cranbournefolkuniting.org website. Our 2018 calendar is now filled! Sincere thanks to those groups/individuals who have put their hand up to volunteer their time and talents without payment. 100% of FUN takings goes directly to the Cranbourne Food Truck. Remember also that we have extended the Spot Acts section to 1 1/2 hours! Chantelle R, Jose Garcia, Sonyta Trahar, Deborah Helen Wright. 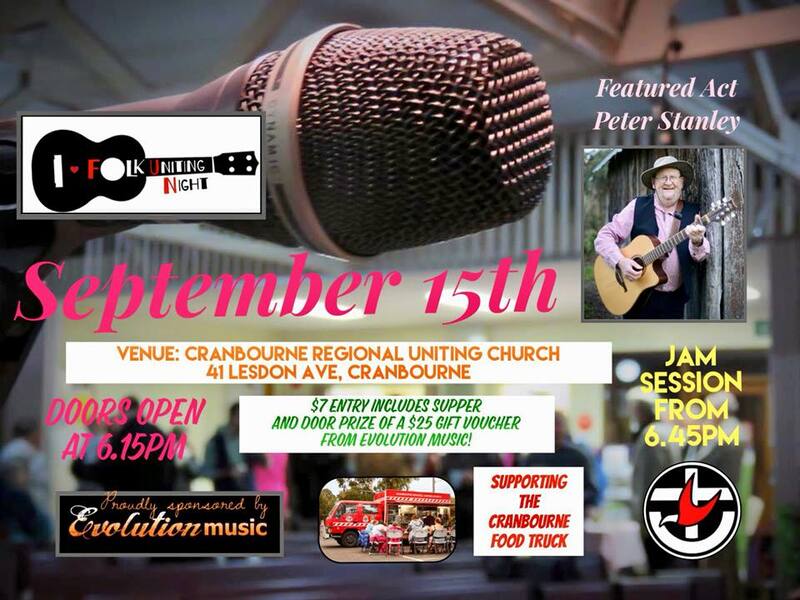 Welcome to the 'Folk Uniting Night' website, hosted by the Cranbourne Regional Uniting Church! If you like live music, good company and don't mind supporting your local community - come along to our concerts, in Cranbourne! Come along and share your songs, poems, dances, music; or just enjoy the evening as part of the audience. Participation and fellowship is the aim, while together we build greater cross-cultural appreciation and sharing, and raise some money for charitable purposes. We will hold our next ‘Folk Uniting Night’ concert at 7.30pm, Saturday 16th of August 2018 at the Cranbourne Uniting Church, 41 Lesdon Ave. Cranbourne, Australia. Cost is $7 per head, $5 for spot acts, featured artists - no charge. Includes supper.